At the 2018 CVRDA Bowmoor event nine Minisails were present and nine sailors. (Only for the record there where: 3 wooden Sprites, 1 Wooden Meson, 3 MS Sprint M2 and 2 MS Monaco. On Saturday morning eight were out on the (very) blue water lake for a stroll. All came back ashore peacefully, none of the boats were harmed in the event. At 1 P.M. the first race was on and there I lost count of how many Minisails were at the mark. At least four I think since I saw three ahead of me. All went fine, as usual starting in the lower half of the pack and now chasing, if only the seat would have held but it didn’t. That was me out of race one. Frans helped rig Sprite 9000 for race two but at the time I was due to get out on the lake winds had picked up to a level I couldn’t cope with in racing conditions. 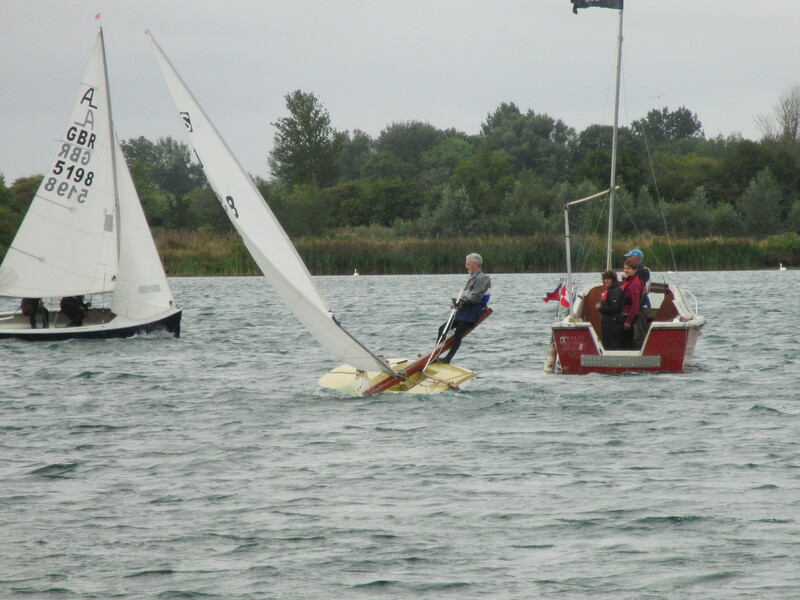 The blustery conditions however didn’t bother Rupert Whelan or Steve Whitby, both continued racing every race. Tireless Tom More showed us his usual habit with both feet on the gunnel giving us as spectators ashore a good lesson. A report on the races here. A big thank you to the Bowmoor SC crew, the event was outstanding. This entry was posted in meetings/racing and tagged cvrda, Minisail, Minisail Nationals, minisail racing, racing by ronnydg. Bookmark the permalink.